It’s been a while since we’ve played a text adventure, isn’t it? It certainly feels that way. And while The Hobbit technically isn’t, the version we’re playing having some graphics, they’re simple interpretations that don’t actually affect gameplay or puzzle solving. I’ve always enjoyed Tolkien’s Middle Earth, as seen in the Lord of the Rings and have probably read more about it than I should. 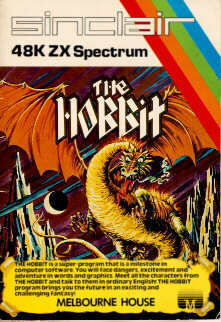 The Hobbit is the one game of many made based on it that made it onto the list, and it’s an early one too. The length should make it nicely playable too, unlike (say) the massive Lord of the Rings RPG series from the early 1990s. So sure, the graphics for the game are indeed not very relevant – after the first time, the game doesn’t even bother showing it to you unless you specifically ask for it. As it doesn’t update, it’s fine anyway, showing the setting but not contributing much after. Beyond that it becomes a straight forward text adventure, feeling like Zork in its setup and how the world moves on. An immediately interesting feature comes from your companion. While you play as Bilbo, Gandalf and Thorin accompany you in the world – although while they partially stay near you, Gandalf in particular wanders a lot and does not seem to be necessary to finish the game. The game covers a lot of ground from the books, allowing a lot of puzzles to be solved using the book’s solution if not bypassed. It still, obviously, leaves out large parts as the characters just aren’t in the game, but as an exploration of the book, it works really well. With a reactive world, the game doesn’t need to be huge to be fun. The NPC interactions add a lot to gameplay and the puzzle selection is varied enough that just wandering around leaves you with plenty of options. While there’s a “for its time” caveat, the game was a lot of fun to jump into again.